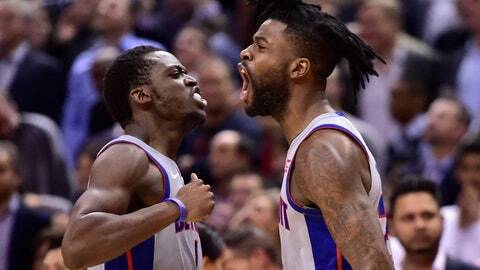 TORONTO (AP) — Reggie Bullock made the winning shot as time expired and the Detroit Pistons rallied from a 19-point deficit to beat the Toronto Raptors 106-104 on Wednesday night, giving coach Dwane Casey a victory over his former team. LOS ANGELES (AP) — LeBron James had a season-high 44 points, 10 rebounds and nine assists, passing Wilt Chamberlain for fifth place on the NBA’s career scoring list and leading Los Angeles over Portland. James scored 28 points in the second half and vaulted past Chamberlain on a three-point play with 3:55 to go, finishing the night with 31,425 points. James also fell just short of his 75th career triple-double during his most impressive performance since joining the Lakers in the offseason. But while James delivered a dazzling performance in Los Angeles’ fourth straight victory, it wasn’t all good news for the Lakers (8-6). Afterward, coach Luke Walton said Rajon Rondo broke his hand during the game. The veteran point guard will be sidelined for at least a few weeks. Damian Lillard had 31 points, 11 assists and eight rebounds, and CJ McCollum scored 23 in the Trail Blazers’ first road loss to the Lakers since Feb. 22, 2013, ending a nine-game streak at Staples Center. Portland has lost two straight to the Lakers after winning 16 in a row. JaVale McGee scored 20 points and Brandon Ingram added 17 in the Lakers’ sixth win in seven games. MILWAUKEE (AP) — Marc Gasol scored 29 points, Mike Conley added 26 and Memphis used a late 15-2 run to hand Milwaukee its first home loss of the season. ORLANDO, Fla. (AP) — Jimmy Butler had 14 points in his Philadelphia debut, but the 76ers collapsed late and lost to Orlando after Terrence Ross hit a tiebreaking 3-pointer with 8.7 seconds. MINNEAPOLIS (AP) — Karl-Anthony Towns had 25 points and 16 rebounds, Andrew Wiggins scored 23 points and Minnesota beat New Orleans to to improve to 2-0 since trading Jimmy Butler. Jeff Teague added 14 points and 14 assists. E’Twaun Moore scored a season-high 31 and Anthony Davis had 29 points and 11 rebounds for the Pelicans. The game was Minnesota’s first with forwards Robert Covington and Dario Saric. They were acquired from the Philadelphia 76ers along with injured guard Jerryd Bayless in exchange for the disgruntled Butler. DALLAS (AP) — Harrison Barnes scored 19 points and Dallas handed the Jazz their worst loss since moving to Utah. Utah was a point off its lowest-scoring half, set against the Los Angeles Lakers on Feb. 4, 2000. OKLAHOMA CITY (AP) — Paul George scored a season-high 35 points to help Oklahoma City rout New York. BOSTON (AP) — Kyrie Irving had 17 points and seven assists and Boston routed Chicago. WASHINGTON (AP) — Bradley Beal scored 20 points, Otto Porter added 15 and Washington beat undermanned Cleveland for its third straight victory. PHOENIX (AP) — T.J. Warren scored 16 of his 27 points in the first half and Phoenix built a big lead, almost lost it and then pulled away to beat San Antonio. NEW YORK (AP) — Tyler Johnson scored a season-high 24 points, Goran Dragic had 21 and Miami beat Brooklyn to snap a three-game losing streak.